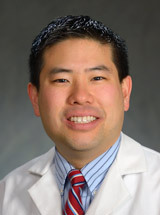 Dr. Uy is employed by Penn Medicine. Blauth Kates Nicholas: Osteoporotic Fracture Care AOTrauma 1 : 2018. Zhao Y, Kotcher R, Uy J.: Diagnostic Dilemma of FAST in A Geriatric Trauma Patient. Journal of the American Geriatric Society Abstract Supplement (B40): S107,2018. Neuman M, Allen S, Schwarze ML, Uy J.: Using Time-Limited Trials to Improve Surgical Care for Frail Older Adults. Annals of Surgery 261 (4): 639-41,2015. Friedman SM, Uy J.: Venous thromboembolism and postoperative management of anticoagulation. Clinics in Geriatric Medicine 30 (2): 285-291,2014. Rollin Wright, Anne Kisak, Joshua Uy: "Is it worth it?" A collaborative clinical decision making exercise. International Conference on Interprofessional Practice and Education Poster : 2014. Joshua Uy: Elder Care A Resource for Interprofessional Providers: Discussing CPR with Patients and Families. POGOe - Portal of Geriatrics Online Education; 2014 Available from: http://www.pogoe.org/productid/21728 : 2014. Joshua Uy: How to discuss code status and make a recommendation. POGOe - Portal of Geriatrics Online Education : 2013. Uy J, Forciea MA. : In the clinic: Hearing loss. Annals of Internal Medicine 158 (7): ITC4-1,2013. Uy JD, Agawu A.: Screening is not as simple as it may seem. Pediatrics 131 (4): 1384-5,2013. Kurtis Hiatt: 9 Warning Signs of Bad Care US News and World Report. http://health.usnews.com/health-news/best-nursing-homes/articles/2013/02/26/9-warning-signs-of-bad-care : 2013.